In Japanese anime, they don't get much bigger than Rei Ayanami from Neon Genesis Evangelion. Starting this month, I mean that literally. 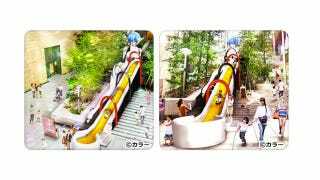 Between July 25 and August 26, an 18.5-meter (61-foot) version of the Eva heroine will be erected along side a slide in Tokyo's Shiodome as part of a summer event. Visitors can ride the slide free of charge. Could this be the year Japan shifts gears from giant mecha statues to giant anime heroine statues?